Salema is the nearest village from Figueira. Easy to find and just a 5 min drive from our guesthouse. Out of the front door you turn left, on the main crossing you turn right. After about 100m there is a road to the right with a sign saying: “Salema”. Follow this road over the hill and you will reach the centre of town automatically. Salema is a small village on the beach. This village has all amenities available. Including lovely restaurants, some souvenir shops, supermarket and a lovely calm easy accesible beach. Enjoy a lovely pizza at Pizza Mobile or a more traditional dish at Boia restaurant. The beach in Salema is quite long and has nice golden sand. At both ends the beach is interrupted by the cliffs rising from the sea. In the western end of the beach you can find a big, flat yellow rock with footprints from a dinosaur. Perfect beach to enjoy a carefree time with children. Accesible by wheelchair as well. On the corner of the boulevard in the shade, are usually some Portuguese fishermen. Enjoying the view and resting for the next trip. This village still has fishing boats launched from the beach by a tractor, and there is always a helping hand to handle a boat when needed. The village square is next door neighbor to the Atlantic sea. If you go left up the narrow Rua dos Pescadores, you see the old part of the village with the small white washed cottages and cobbled streets. On the right hand of the square you find the newer part of Salema. Come and see the sea! Our guesthouse is very close to both the west coast and the south coast. We have some of the most amazing beaches and sea wildlife here. Therefore it is a big recommendation to explore some of the activities that this area has to offer on the sea. 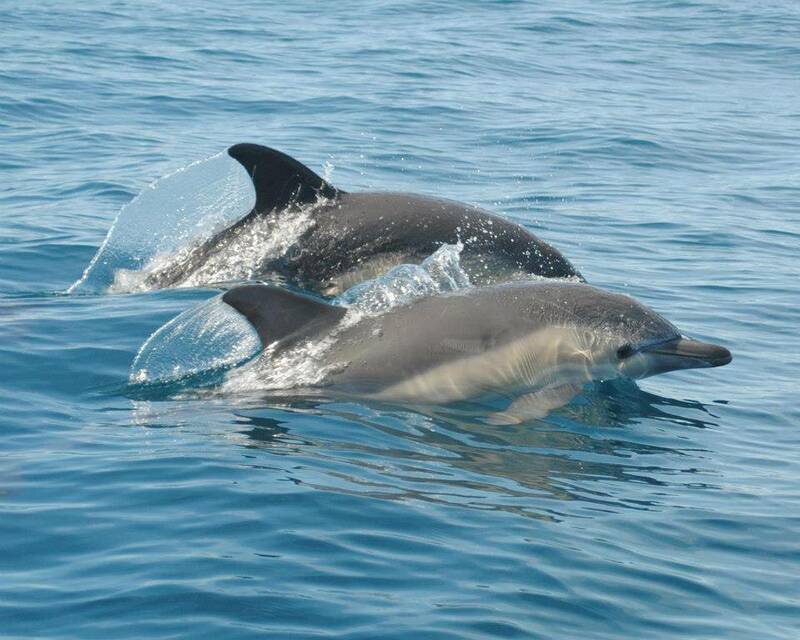 In Lagos and in Sagres there are several company’s that can take you on a speedboat to go and see the dolphins. The dolphins live close to our coast all year round. This is definitely a must sea! We recommend to go with Seafaris (the boat in the picture) in Lagos, they have the fastest and biggest boat. And they are very customer friendly. You can book your tickets with us. There are several different options to go sailing. There are private charters or group tours, full day trips or just a few hours. For more information ask us. Around Praia da batata are many companies that make kayak trips. You can go and visit the famous caves of Lagos by kayak with a support boat following the group. Usually they go in groups of around 20 people. Right on the batata beach there is one company called Kainui, they have a wooden chalet on the beach. There you can just rent kayaks and you can go by yourself. They also have Sup boards. 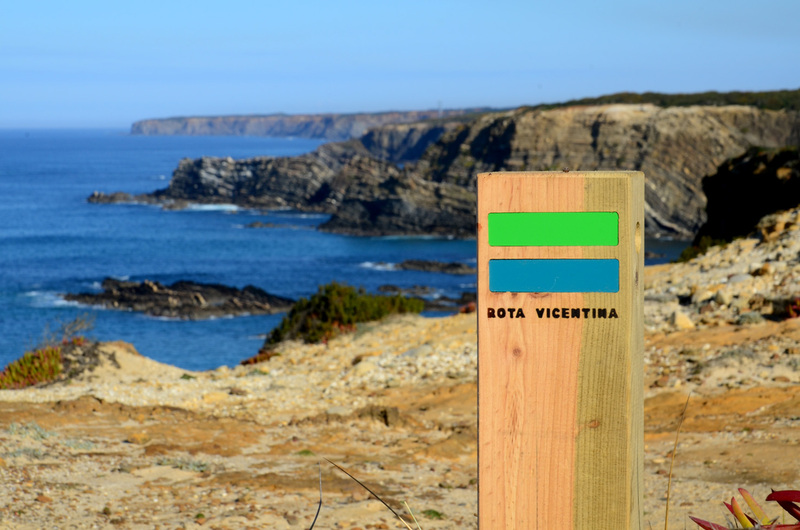 Portugal’s west coast is famous for it’s many surf spots. Praia cordoama, praia da Castelejo and praia Amado are just some of the beaches that have surf schools. Best just to show up and ask for lessons or/and rentals. The south coast doesn’t have much good swell. 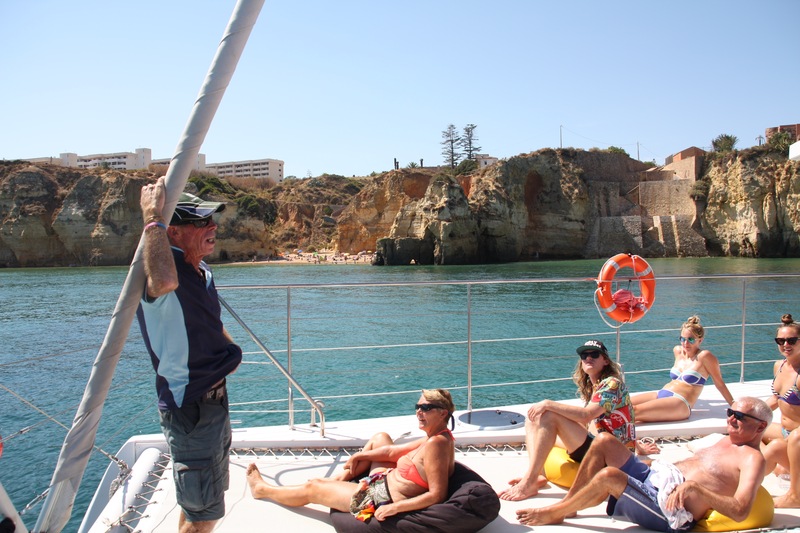 With a small boat from the Lagos marina you can go and see the caves. They will drive the boat inside some of the caves and the captain will explain you about the history, the fortresses and all the different names of the caves and beaches. The most famous point is Ponte da Piedade (on the picture on the right). It is also possible to go fishing, rent a jetski, and many things more. Just tell us what you would like to do and we will recommend you where to go. Great experience! Nienke is a very kind host and she answered fast before and after the booking. The house is a really nice apartment in a beautiful garden with flowers and fruit trees where you can eat (there is a little table) or rest after a busy day at the beach. The pictures don’t show as the apartment is: the house is better!! The house is closed to shops and to a really nice beach you can reach by a 15mins walk in the beautiful nature of Algarve. I’ve appreciated the little book that Nienke left in the house with the presentation of some of the towns near there and with some suggestions of activities to do. And if you need more information Nienke and Joao are available to find what you need. Very positive experience and if I’ll come back I know where I can stay! Nous avons passé un agréable séjour dans cette charmante petite maison, simple, calme, entourée d’arbres et de verdure, située dans un village tranquille, à 15 mn à pieds d’une petite plage sauvage et encore peu fréquentée par les touristes. Merci à nos hôtesses pour leur accueil, leur gentillesse et leur disponibilité à répondre à toutes nos interrogations, malgré la barrière de la langue (nous parlons très peu anglais) qui nous a empêché de dialoguer autant que nous l’aurions souhaité. Sentimo-nos muito bem nesta casinha simples mas com tudo o que é indispensável. A Nienke e o João foram extremamente simpáticos e acolhedores. A localização da casa, a uns 15′ a pé da praia, é um ponto muito forte. The communication in advance was very nice and informative. During our stay Nienke and her boyfriend made sure we had everything we needed and provided us with insider tips on what to do and where to go. So e.g. we were able to find an awesome spot to watch the sunset. The house was as described and we felt very much at home. Especially the garden with the outside shower was just perfect – we found fresh lemons and mulberries and enjoyed our evenings sitting in front of the house – accompanied by the lovely cat. What we really love about the place is that it is perfect for people who like to communicate with the host but also for people who enjoy a little more privacy – since this place offers both ? 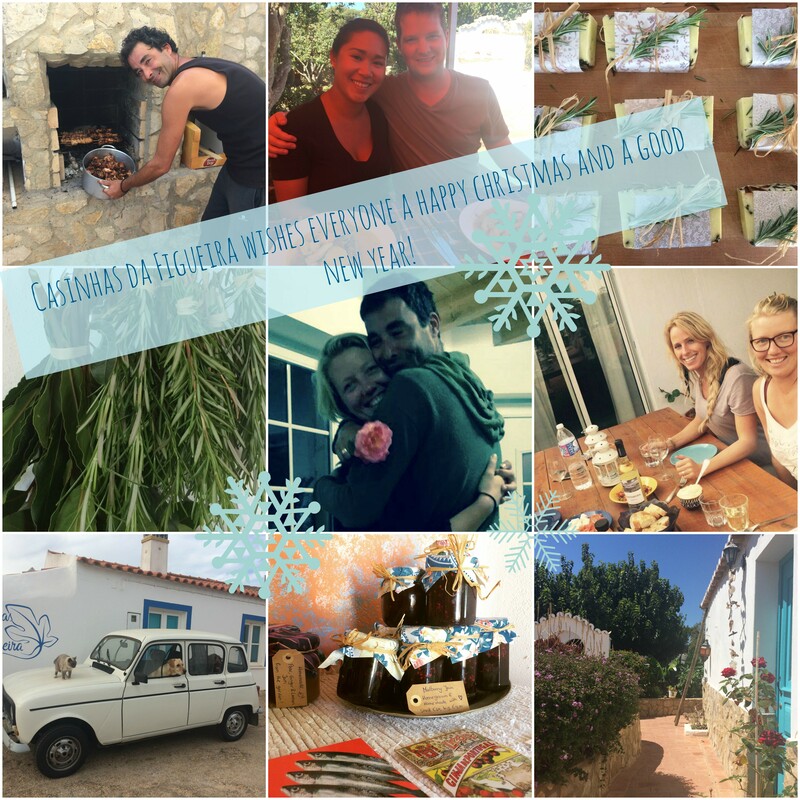 We are already planning to come back next year- as its location is just perfect for exploring the Algarve and its numerous beaches and sights ?